These decadent Dulce de Leche Rice Krispy Treats are the perfect way to satisfy one last sweet craving for the year. I warn you though, it will be hard not to crave them next year too! This week's Sunday Supper is all about those end of the year cravings. You know, that little something that you have just been dying for? Maybe you have wanted some rich creamy pasta dish, or elegant seafood? Whatever it is, let go and indulge yourself. You deserve it, and we won't tell! The end of the year is my time to just let go and have fun. All of my calorie counting goes right out the window. I pretty much avoid sugar all year long. I might make a treat here and there, but Kevin or my kids are my intended targets so I can dodge that calorie bullet. They aren't real happy with how that works out once they see the scale, but up until then it seems everyone is happy with the arrangement. Now my son and his fiance are expecting, so sweet treats are very welcome, so I know where they will be going for the next several months!! Although my son is already complaining a bit about his "baby weight". This year I really went all out over the holidays though. There were so many goodies going though my kitchen, that my counter space was nearly nonexistent! My normally non-sweet loving guy decided that he wanted me to keep them all, no packages for the kids. Ya well, that lasted a week or so and then I started pulling my hair out. I grabbed a bag, some boxes, and out the door went close to 5 pounds of goodies. Yes, you heard that correctly. 5 flippin' pounds of sweets!! I took them to my son at work and he, his fiance, his boss, and several customers, thanked me profusely for the sugar high. I was just doing the happy dance because I had room in my kitchen again! When you have a kitchen as small as mine (it ain't called "kozy" for nuthin' gang), it can get quite claustrophobic very quickly. But, once I got home to my nice clean kitchen, I knew I had to do something with the Dulce de Leche I had made a week or so ago. I had never had it before, and once I tasted it I was hooked! I had to fight myself not to just eat it from the jar with a spoon! OhhEmmmGeeee it is amazing!! So I decided to take a childhood treat I have been craving, and mash it up with my newest addiction. and WALA, I give you these fantabulous little beauties! You can eat them as is or, take them over the top like I did by spreading more Dulce de Leche over the top and sprinkling them with some sea salt......heaven!! Butter an 8 by 8-inch baking pan, along with the bowl and utensils you will be using. In a large saucepan over medium heat, melt the butter. Add the marshmallows and dulce de leche and stir until the mixture is melted and creamy. Pour the Rice Krispies cereal in a large bowl. add the butter mixture over the cereal and stir until the cereal is well coated. Spread the mixture evenly into the prepared pan and refrigerate for 10 minutes, or until firm. Slice into squares and sprinkle with sea salt if wanted. Now check out the rest of this great line up of Food Craving Recipes for this week’s Sunday Supper on 12/28! Great way to clear house of temptation for the new year, Bobbi! Yum! Bring on the dulce de leche! Such awesome rice krispy treats! Holy moly, hold me!!!! These sound so decadent and wonderful...I'll take a tray, please! Rice Krispies Treats are such an ultimate comfort food! Love this twist on the classic. Ohhh, what a great twit to Rice Krispies! I love it! Who wouldn't be craving this deliciousness? Wow! 5 pds of sweets? Wow, you really baked up a storm! 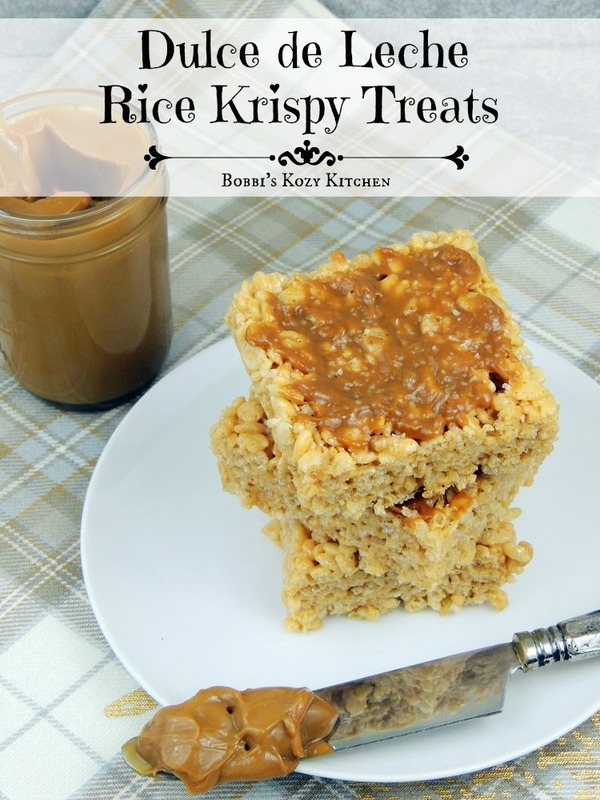 Love how you made this Rice Krispies sophisticate with the Dulce-de-Leche! What a great idea! Rice Krispies are always a fun treat, but adding dulche de leche?! Now that's even better! I LOVE dulce de leche ANYTHING! Can I just lick the knife?? Please? I'm so making this with my kids this week! Yummy! What a great treat!! Dulce de leche on almost anything is something I can never resist!!! This is just what I needed - I have a part jar of DDL in my fridge right now!